Petrus Alphonsi (1062-1110) was an astronomer and the physician of the English king Henry I (1068-1135) and to King Alfonso VI of Castile. He was also the author of the Disciplina Clericalis (Training School for the Clergy). 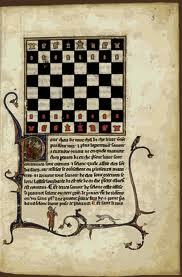 He included chess as one of the seven knightly accomplishments to be mastered. The other tasks included riding, swimming, archery, boxing, hawking, and verse writing. The first use of algebraic notation is from a French manuscript written in 1173. The first use of the figurine algebraic notation occurred in Belgium in 1927. It wasn’t until 1974 that the first book employing the algebraic notation was published by a major American publisher. The Alfonso Manuscript (pictured) was ordered by Alfonso the Wise (1221-1284), King of Castile. It included chess, backgammon, and games of chance with dice. Compiled in 1283, it is entitled Juegos Diuersos de Axedrez, Dados, y Tablas con sus Explications, Ordenudos por man Dado Del Rey don Alonso el Sabio. It is the first source mentioning the pawn’s double move on the first move. The manuscript contained over a 100 chess problems. Aladdin (Ala’addin at-Tabrizi) was the strongest chess player at the end of the 14th century. He was also known as Ali Shatrangi (Ali the Chessplayer). He could successfully give odds to all other leading players and play up to 4 games simultaneously, while blindfolded. Some consider him the first world chess champion. He was also a lawyer and a scholar in the court of Tamerlane (1336-1405). Aladdin was Chinese. This is the same Aladdin in children’s stories, but he never had a magic lamp or genie. Ajedrez is the Spanish word for chess. The Portuguese player, Pedro Damiano (1480-1544), wrote a Spanish book, Questo libro e da imparare giocare a scachi et de li partiti, in 1512, suggesting chess was invented by Xerxes and should be named after Xerxes, hence, the word Xadrez in Portuguese and Ajedrez in Spanish. Damiano was a pharmacist by profession. Atahualpa (1497-1533) was the 12th and last Inca emperor of Peru (Tawantinsuyu or Incan Empire) who was imprisoned by Francisco Pizarro and the Spanish conquistadors in 1532. He learned chess by watching his guards play, and before long was beating them all. It is said that a certain Spanish captain hated him for this and had him murdered (strangled with a garrote). Atahualpa may have been the first American chess player. The first mention of chess in North America occurred in 1641 according to Esther Singleton’s (1865-1930) book called “Dutch New York,” published in 1909. It described the early Dutch settlers in New York playing cards, chess, backgammon, and dice. However, in 1734, Benjamin Franklin (1706-1790) played the first reported chess game in North America. During the American Revolution, there was a strong effort by the colonists to rename the pieces to Governor, General, Colonel, Major, Captain, and Pioneer. A good revolutionary would not play with kings, queens, knights, and bishops. There was a similar effort to rename the chess pieces during the French Revolution. Aaron Alexandre (1766-1850) was the author of Encyclopedie des Echecs, the first book containing the collection of all opening variations then known. Published in 1837, he introduced the algebraic notation and the castling symbols O-O and O-O-O. He also wrote The Beauties of Chess in 1846, the first large compilation of chess problems and endgames (nearly 2,000 problems). He was a German teacher and a mechanical inventor. The Scottish Chess Association (SCA) is the oldest chess association in the world, founded on February 2, 1884. It is now called Chess Scotland. The first Scottish chess champion was John Crum (1842-1922) of Glasgow in 1884. Crum was a noted endgame composer and edited a chess column in The Glasgow Weekly Herald. In 1903, Prince Andria Dadian of Mingrelia (1850-1910) was President of the Monte Carlo Tournament Committee. When Mikhail Chigorin of St. Petersburg showed up to play in the Monte Carlo International Tournament, Prince Dadian refuse to let him participate, even though Chigorin was invited and had already made the long journey from St Petersburg to Monte Carlo. Prince Dadian’s demands were based on his claims that Chigorin embarrassed the prince in person and in print by publishing some analysis of one of the prince’s games, pointing out that the prince had made several gross errors. Chigorin was not allowed to play, but he received compensation (1,500 francs paid by the prince) in the amount greater that the third prized in the tournament. Colonel Moreau of France played instead of Chigorin. Moreau then proceeded to lose every game (26 straight losses). Siegbert Tarrasch and Geza Maroczy tied for first at Monte Carlo. The winner was to receive a valuable art object as well, but the players wanted to play for money also. This annoyed the Prince, who gave the art object to the 3rd place finisher, Pillsbury. Prince Dadian was a member of the Mingrelian (Western Georgia) royal family. He graduated from Heidelberg Univeristy Faculty of Law in 1873 and server as a lieutenant general in the Russian army. The first American Women’s Chess Congress was held at the Hotel Martha Washington in New York in May, 1906. It was won by Mrs. Natalie Nixdorff (1854-1937) of New York. She won every one of her games. She was born in Germany and came to the USA with her family at the age of 2. The women’s tournament only had 3 women in the championship section and 6 in the general tournament. The entire world championship match between Alekhine and Capablanca in 1927 took place behind closed doors in Buenos Aires, Argentina. There were no spectators or photographs. The match lasted for over 2 months with 34 games played. 32 of the 34 games was a Queen’s Gambit. Alekhine won with 6 wins, 3 losses, and 25 draws. Jose Joaquin Araiza Munoz (1900-1971) won the Mexican chess championship 15 times in succession. In 1932, he organized the first international chess tournament held in Mexico. He took 3rd, behind Alexander Alekhine and Isaac Kashdan. He was a Captain in the Mexican army. In 1940, the first U.S. Open chess tournament was held in Dallas and won by Reuben Fine. Prior to 1940, the U.S. Open was known as the North American Open. Prior to the North American Open (organized by the American Chess Feeration), it was known as the Western Open (organized by the Western Chess Association). In 1961, Manual Aaron (1935- ) became the first player from India to be awarded the title of International Master. It took 17 years before India produced its second International Master (V. Ravi in 1978). Vishy Anand became India’s first grandmaster in 1988. Aaron won the championship of India 9 times. Heinrich Freankel (1897-1986) was an author and Hollywood screenwriter most notable for his biographies on Nazi war criminals (Himmler, Hess, Goebbels, Goering, etc). He wrote chess books and a chess column under the pseudonym of Assiac (Caissa spelled backwards). In 1976, woman grandmaster Anna Akhsharumova (1957- ) finished first in the 1976 Soviet Women’s Championship. Her husband, GM Boris Gulko, tied for first in the 1977 Soviet Men’s Championship. By all rights, she should have won the 1983 Soviet Women’s title played in Tallinn when she defeated her main competitor, Nona Ioseliani after she won by time forfeit. It would have given her 12 points to Nona’s 11 points. The next day, Ioseliani filed a protest alleging a malfunction in the clock. Anna refused to play. The result of her game was arbitrarily reversed by the All-Union Board of Referees in Moscow, thereby forfeiting her title and ending up in 3rd place. She regained the Soviet women’s crown in 1984. She and her husband came to the USA in 1986. In 1987, she won the U.S. Women’s Chess Championship with a perfect 9-0 score. The chess program HIARCS (Higher Intelligence Auto-Response Chess System) was first written in 1980 by British teenager Mark Uniacke. The first version was written in BASIC, and could search one move ahead and took 30 seconds to make each move. By 1991, the program could search 800 moves a second on a 386 processor before playing its best move. In 1993, it won the World Microcomputer Chess Championship. In 1995, the program could search 20,000 positions a second. In the mid-1990s, world champion Garry Kasparov began to use HIARCS in his training. HIARCS is now in its 14th version. It can now search over a million positions per second. In 1997, the longest checkmate announced in blindfold simultaneous chess occurred when Hindemburg Melao, Jr. announced checkmate in 12 moves at Sao Paulo, Brazil in one of his games of a 9-board blindfold simul. The previous record occurred in 1877 when Joseph Henry Blackburne announced checkmate in 8 moves in one of his games of a 10-board blindfold simul. In June 2009, Bobby Fischer’s personal chess library was sold for $61,000 to Rex Sinquefield (1944- ), a retired financial executive. Sinquefield acquired the collection through the San Francisco-based auction house, Bonhams and Butterfields. The collection included 320 chess books and about 400 issues of chess-related periodicals. In 2011, the original 1972 World Chess Championship chess set used by Fischer and Boris Spassky was sold for $76,275.